Population ageing and increasing survival rates of colorectal cancer patients are leading to an increasing number of colorectal cancers survivors worldwide. Many of these individuals experience long-lasting side effects due to the cancer or its treatment, such as bowel problems or fatigue, which can severely impact their quality of life. Increasing physical activity and reducing sedentary behavior have been proposed as means to improve health and functioning of colorectal cancer survivors, but there is still a paucity of research on this topic. Consequently, there are no specific guidelines on physical activity and sedentary behavior available for colorectal cancer survivors to date. 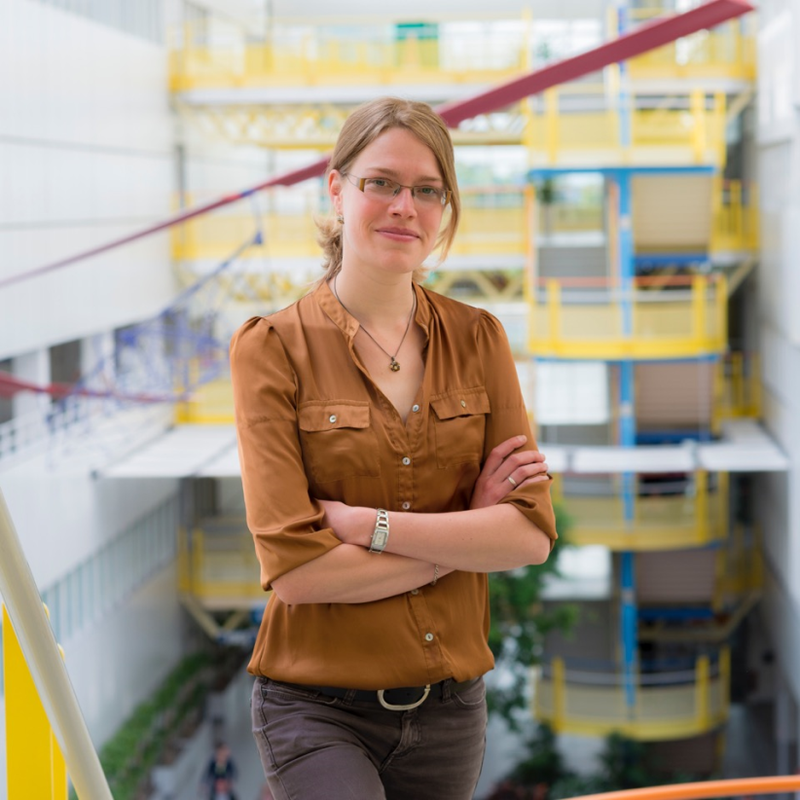 Within her PhD research, Eline van Roekel has applied a bio-psychosocial approach to study associations of physical activity and sedentary behavior with quality of life in colorectal cancer survivors. She observed that next to higher levels of moderate-to-vigorous physical activity, more light intensity physical activity and less sedentary behavior were associated with better quality of life outcomes in colorectal cancer survivors. This provides important leads for further research on these new potential targets for lifestyle interventions for this population. For this PhD research, data were used from the Energy for life after ColoRectal cancer (EnCoRe) study. This observational study was initiated by Eline van Roekel and her supervisors at the Department of Epidemiology at Maastricht University, in collaboration with medical specialists and nurse practitioners at the Maastricht UMC+. The aim of the EnCoRe study is to investigate associations of lifestyle factors, including diet, physical activity and body composition, with quality of life in colorectal cancer survivors. During the design and conduct of this study, a bio-psychosocial conceptual approach has been applied based on the International Classification of Functioning, Disability and Health developed by the World Health Organization. Thereby, quality of life and functioning is being measured and analyzed in a comprehensive way, by including physical aspects of health as well as psychosocial aspects and the ability of individuals to participate in society. The EnCoRe study consists of an ongoing prospective study, in which colorectal cancer patients are being included at diagnosis and followed up until 2 years post-treatment (Figure 1). 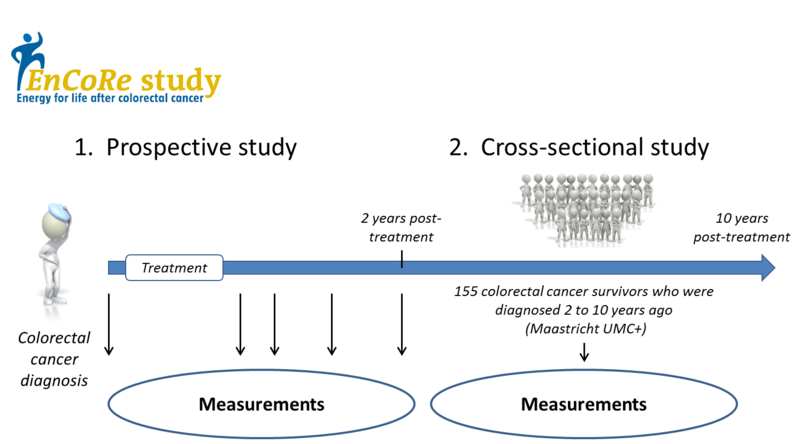 Repeated measurements of several lifestyle factors and quality of life outcomes are performed. To also study the survivorship trajectory after 2 years post-treatment, a complementary cross-sectional study was conducted in 2012 in 155 individuals, who had been diagnosed with stage I-III colorectal cancer between 2002 and 2010 at the Maastricht UMC+. Within these individuals, several measurements were performed at one point in time and these data were used for the results presented in the thesis of Eline van Roekel. Design of the prospective and cross-sectional part of the Energy for life after ColoRectal cancer (EnCoRe) study. Data of the cross-sectional part were used for the research described in the PhD thesis of Eline van Roekel. The overall aim of this PhD thesis was to study associations of physical activity and sedentary behavior (i.e. sitting or lying at low energy expenditure during waking hours) with quality of life in colorectal cancer survivors. The quality of life outcomes there were studied comprised global quality of life, physical functioning, role functioning (i.e. the ability to perform normal daily activities), social functioning, disability, fatigue and distress. A qualitative overview of the results is provided in Table 1. First of all, associations were studied of self-reported physical activity with quality of life outcomes. In particular, Eline van Roekel studied associations of light physical activity (e.g. light household work) and moderate-to-vigorous physical activity (e.g. cycling and heavy household work) with quality of life. She observed that more self-reported time spent in both light and moderate-to-vigorous physical activity were associated with better physical functioning. In addition, more time spent in light physical activity was also associated better role functioning and less disability. 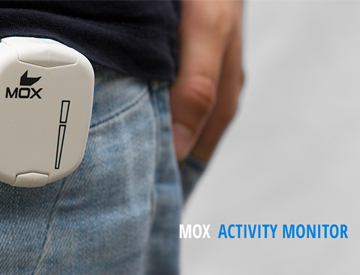 Besides self-reported physical activity, levels of sedentary behavior and physical activity were measured using the MOX activity monitor (Maastricht Instruments, B.V.). The participants wore the tri-axial MOX monitor, attached with a plaster on the anterior thigh, 24 hours/day for seven consecutive days. Data were obtained on daily time spent in sedentary behavior, standing and physical activity. In addition, it was determined how much daily time was spent in prolonged uninterrupted periods (bouts) of sedentary time of at least 30 minutes, as well as the usual duration of sedentary bouts. Eline van Roekel observed that more time spent in total and prolonged sedentary behavior and longer usual bout duration were associated with a lower reported level of physical functioning, and higher levels of disability and fatigue. She also found that more prolonged sedentary time and longer usual bout duration were associated with worse global quality of life and role functioning. To be able to eventually develop effective lifestyle interventions to reduce sedentary behavior, it is important to study by what type of activity sedentary behavior should be replaced (substituted). For that purpose, Eline van Roekel applied a statistical technique (isotemporal substitution modelling) to model the substitution of 1 hour/day of sedentary behavior with 1 hour/day spent standing or in physical activity, and to investigate how these substitutions were associated with quality of life of colorectal cancer survivors. She found that substituting sedentary time with standing or physical activity was associated with better physical functioning. In addition, substitution of sedentary time with standing was associated with less disability and fatigue. Key: [+]significant positive association, [-]significant negative association, no significant association.a Average time spent in sedentary bouts with ≥30 minutes duration per day.b Bout duration at which 50% of total sedentary time is accrued. Altogether, the results of this PhD research indicate that next to increasing moderate-to-vigorous physical activity, increasing light physical activity and reducing sedentary behavior may be promising new avenues for lifestyle interventions aiming to increase quality of life in colorectal cancer survivors. Further research in the prospective part of the EnCoRe study will be necessary to study whether changes in physical activity and sedentary behavior are also associated with clinically relevant changes in quality of life outcomes. In addition, more research is needed on the underlying biological mechanisms mediating associations of physical activity and sedentary behavior with quality of life outcomes in colorectal cancer survivors. Eline van Roekel defended her PhD thesis ‘Energy for life after colorectal cancer: Associations of physical activity and sedentary behavior with quality of life outcomes in colorectal cancer survivors’ on 15 December 2015 at Maastricht University. This PhD project was funded by the Stichting Alpe d’HuZes within the research program ‘Leven met kanker’ of the Dutch Cancer Society, the Dutch Cancer Society and by the GROW School for Oncology and Developmental Biology. The EnCoRe study is also supported by Kankeronderzoekfonds Limburg (part of Health Foundation Limburg). For more information about the EnCoRe study: http://encorestudie.nl/.